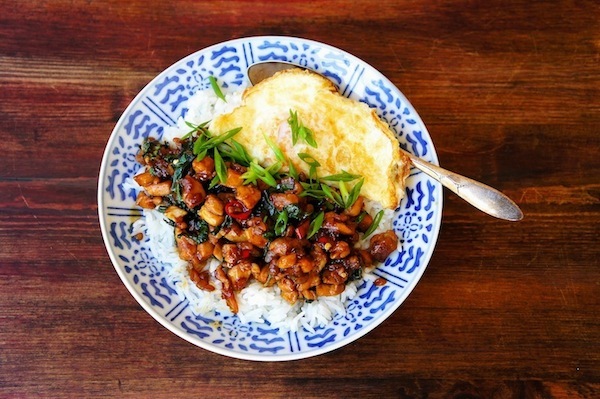 Thai Basil Chicken is one of those amazing dish that is so easy and quick to whip up. Just make sure you have plenty of steamed rice ready, as this stir-fry chicken is slightly spicy, delicious and addictive! Combine the sauce ingredients and mix well. Heat the oil in a wok over moderate heat and cook the garlic, onion and chilies until fragrant. Turn the heat on high and toss in the diced chicken. Give a quick stir, mix in half of the basil, stir and add in the sauce. Bring the mixture to a boil and season with pepper and sea salt, if necessary. Once the sauce has thickened, mix in the rest of the basil. Serve warm with some steamed rice, and top with scallions.